Once a product or kitchen project is installed and ready for commissioning our domestic chef will be present to give individual product training to the end-user. Only correct and optimized use of the equipment will assure the highest productivity and flexibility of the kitchen. At the Metos Center our corporate chefs organize product presentations, cooking demonstrations and educational training for individuals and groups of people throughout the year. Our export orientated chefs provide demonstrations at international trade shows as well as product education to chefs at our distributors and their customers. You are welcome to be shown around and to exchange ideas with us. 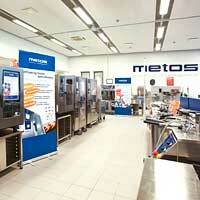 At present, one Metos exhibition and training center is located in Kerava near Helsinki, Finland, one in Stockholm, Sweden, one in Riga, Latvia, and one in Vilna, Lithuania. Please contact our local office or distributor before you visit to make an appointment.